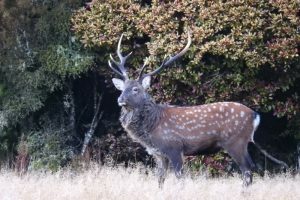 The Sika Deer is a medium-sized Asian herbivore, but found across the world – either native or introduced – and in several subspecies, with the largest being the Manchurian sika deer. Though the sikas are termed as ‘deer’, they are actually a member of the ‘elk’ family. It is also known in several different names like spotted deer, Japanese deer, sika elk, and Asian elk. Size: Depending on their subspecies, the height can vary from 50 to 110 cm (20 to 43 in) at the shoulder, and 95 to 180 cm (37 to 71 in) in head-and-body length. Weight: The weight varies between subspecies, with the average adult weight being 42 kg. Coat: The body hair color ranges from chestnut-brown to reddish-olive, displaying dramatic variations in colors like tan, black, gray, yellow-brown, or gray-brown, and with or without spots, all depending on the subspecies. Body: All subspecies have a compact body and are dainty-legged, while the head is short, trim, and wedge-shaped. Tail: The short tail measures between 7.5 and 13 cm (3.0–5.1 in) in length. Antlers (Horns): The stags have stout, upright antlers that can range from 28 to 80 cm (11 to 30 in), depending on the subspecies. Sexual Dimorphism: Males are considerably larger than the females, and have antlers. The maximum longevity recorded in the wild is 25 years and 5 months. However, in captivity, the average lifespan of the species is 15 to 18 years. The native range of the deer is the southern Ussuri district of eastern Siberia, Japan, China, Formosa, Taiwan, Korea, Manchuria, and some parts of Vietnam. They have also been introduced in many places around the world viz. Australia, England, France, Maryland, Morocco, Oklahoma, Texas, Wisconsin, Virginia, Ireland, Jolo Island (south of the Philippines), New Zealand, Poland, Scotland, Denmark, and Austria. In the wild, the sika deer are mostly found in the temperate and the subtropical forests and woodlands of eastern Asia, as also, around the patchy clearings of jungles, quiet marshes, and forested wetlands. C. n. mantchuricus from northeastern China, Korea, and the Russian Far East. The sika deer is mostly a nocturnal animal and are not gregarious. They have a boisterous disposition and usually lead a solitary life, though rarely seen groups. 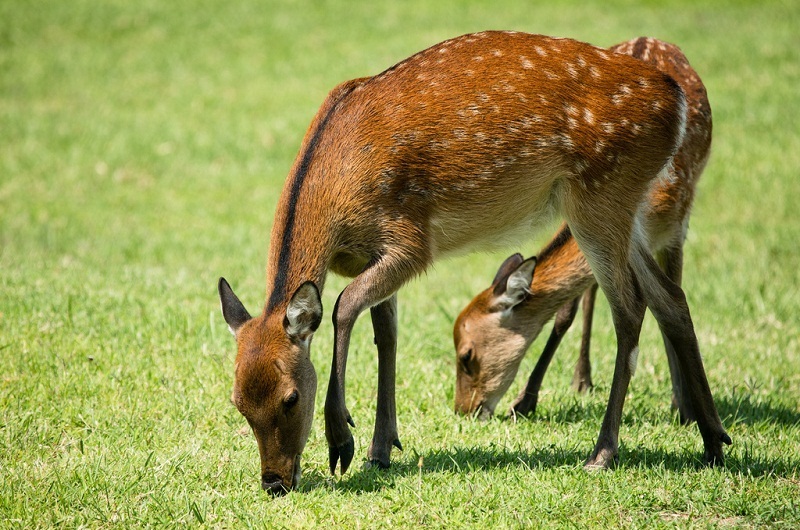 During the breeding season, the female sika deer and its young ones form groups of around 2-3. 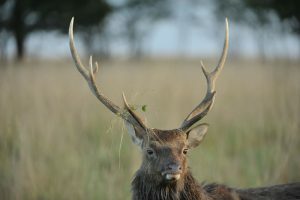 The male sika deer are territorial, marking the boundaries by digging holes up to a width of 1.6 m, and a depth of 0.3 m, using their antlers and forefeet. When done, they urinate in them from time to time to let the other males be alert from the strong musky scent and the urine odor released from that place. 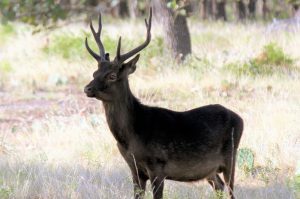 During territorial disputes, the males get aggressive towards each other and often use their hooves and antlers as the primary weapons to fight back the opponent. 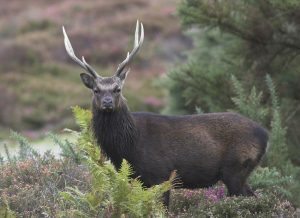 They run medium speed using a stiff gallop, and can jump high making bounds of up to 3 m.
In the absence of the females from their own species, the sika bucks may mate with young hinds belonging to their closely-related red deer that share their range. 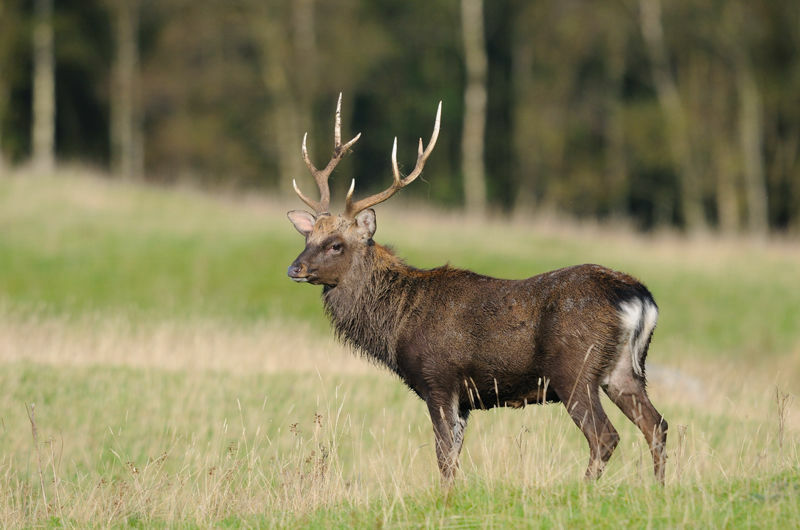 However, the sika bucks are not large enough to rival the red stags. The resultant hybrids are able to breed in either direction. They communicate with each other using at least ten different sounds, including bleats, whistles, and alarm barks. The males are frequently seen emitting long and wailing bugle calls during the mating season. The sika deer, like other species, are herbivore – or more precisely, folivore – depending on plant matters for food, including leaves, roots, tubers, soft wood, bark, stems, seeds, grains, fruits, and nuts. They have also been seen consuming fungus. These deer are polygynous and keep harems consisting of several females during the rutting season. The females are highly receptive between early September and October. The size of territory during the breeding season varies between habitat type, as well as, the buck’s size. 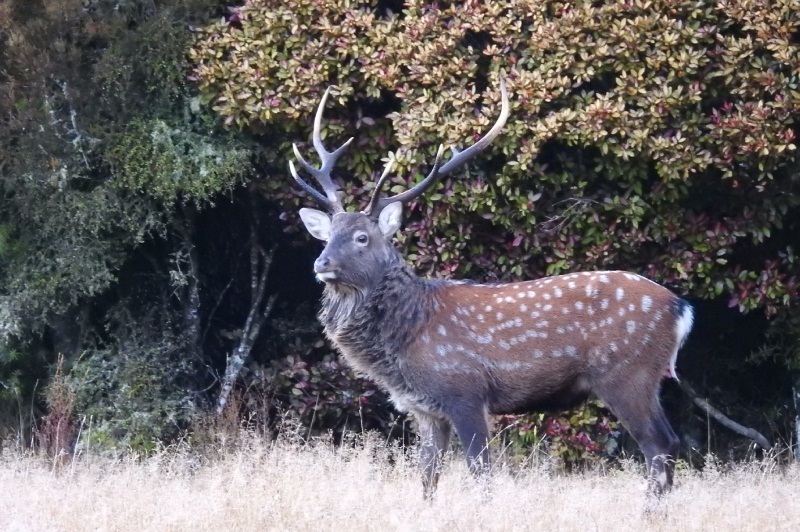 An adult, strong and healthy buck may hold up to 2 ha (5 acres) of land. The gestation period of a healthy doe lasts for about seven months. In most cases, they give birth to one single offspring. During birth, a juvenile can weigh between 4.5 to 7 kg (9.9 to 15.4 lb), and remain under the care and nursing of the mother for up to 10 months. The fawn (baby deer) needs around 10 to 12 months to become independent and forage for their food. The young deer – both males and females – attain the age of sexual maturity when they are around 16 to 18 months old. The sika deer is an excellent swimmer and can readily enter the water to escape from predators. These deer have strong antlers and sharp hooves that they often use for defense purposes. During the winter months, their coat gets rougher, thicker so as to keep them warm, and turns dark grey-brown in color to absorb more sun rays. 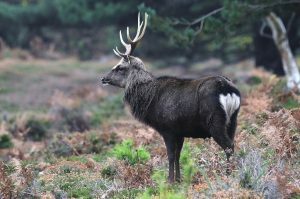 The primary enemies of the sika deer are tigers, gray wolves, leopards, and brown bears, as well as humans for hunting them for meat, skin, and antlers. Lynx and golden eagles usually target the fawns. However, the predators of these deer vary between ranges. Considering their rapid increase in population, and being even considered as an invasive species in many places, the IUCN 3.1 has declared the deer as ‘LC’ (Least Concern). These deer are capable of swimming up to 12 km in the sea. The subspecies Formosan sika deer (C. n. taioanus) has been extinct in the wild for almost two decades. The species is overabundant in Japan, with a 2015 official report estimating their population at 3,080,000, where they are often seen as pets, even roaming in public places. Presently, it is illegal to transfer sika or red deer to the Hebridean islands (Hebrides) to keep away chances of hybridization, since the archipelago retains a good population of pure red deer. It gets its name from the Japanese word shika meaning ‘deer’, while In Japan, it is known as nihonjika that translates to ‘Japan deer’.